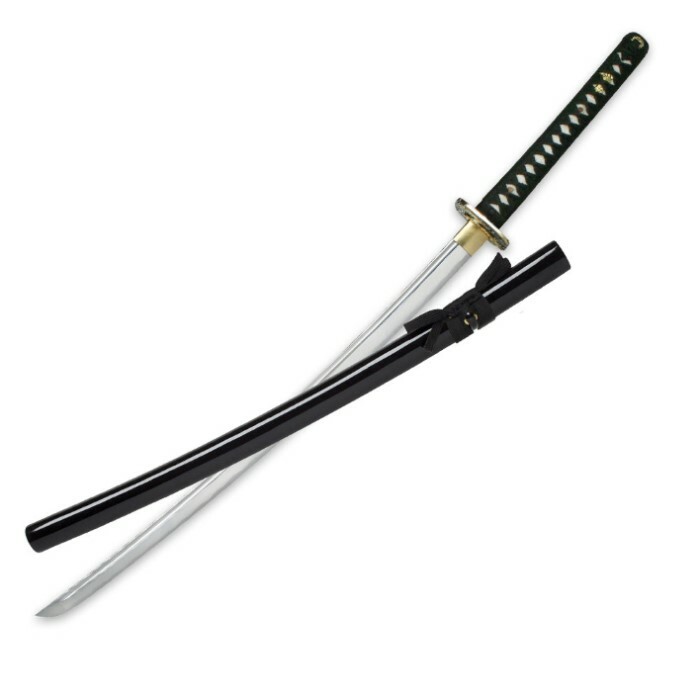 A handmade, battle ready katana is what you get with our line of Ten Ryu swords and each of them is a prized showpiece for collectors.This katana has a magnificent 27 9/10” carbon steel blade with a traditional blood groove. Each Ten Ryu Samurai sword offers a full-tang, high-carbon steel blade that has been forged and tempered using proven methods The handle is covered in genuine rayskin and traditionally wrapped in silk and the decorative battle tsuba is a metal alloy. A black cotton sword bag and display stand completes the package. 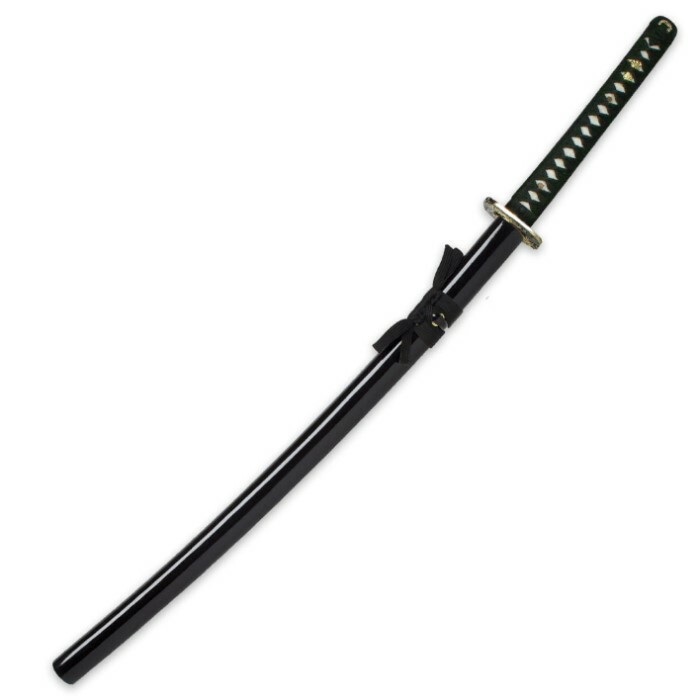 This Samurai sword is 40 9/10” in overall length. the blade and tsuba are just fine, and it fits perfectly in the scabbard. the only problems I've found with mine is that the ito (pommel), and therefore kashira (the wrapping) are loose. in fact it looks like the ito was being held on with glue. decent for a first time sword buyer (like me), but I would not recommend trying to fight with it. I am a practitioner of kendo, as well as disciplined in a handful of other martial arts. That said, this sword surprised me with its striking detail and total overall aesthetic appeal. I bought this sword for kata practice, and heavy cutting tamishigiri, which it does superbly. 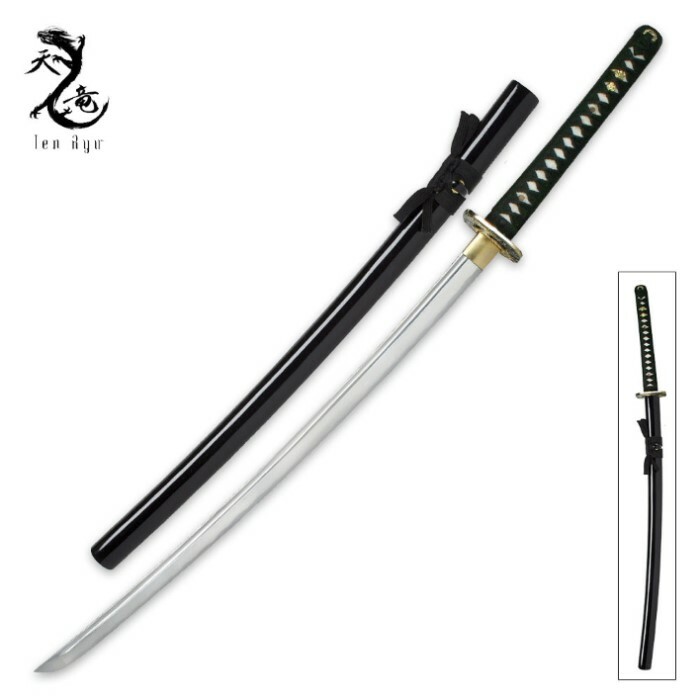 This $70 sword has no peer anywhere in this price class that I can guarantee. It's a must buy for martial artists and collectors alike. You will regret not buying this one should you ever get the chance to hold one of these. My only complaint is that the bo-hai( blood groove), and squared tsuba are in fact not traditional or even historically accurate for a true, certified, Japanese sword. There is only round or oval or no tsuba historically. As for the bo-hai, traditional katana from the Edo period and through to current date, have no blood grove. You only get blood groves with Chinese made swords which other than those two things, are otherwise perfectly great for use and price at much lower than expected for quality of material and craftsmanship. This sword even has genuine ray skin and SILK wrapping on the handle and saya, even the sageo knot is silk! This is the first sword in this price class that offered real silk. Usually you have to get a $200-$1000 sword for silk wrap. Buy it or wish you had. 5 stars all the way. Oh and all ten-Ryu swords are battle ready full tang beautiful beasts of destruction on par with bushido brand and shinwa. good sword feels good in hand good handle, just good sword buy!